First and foremost, a referee’s priority in an MMA fight is to ensure the safety of the two combatants. But unfortunately, over the years there has been a disturbingly long list of late stoppages in fights where this simply has not been the case. 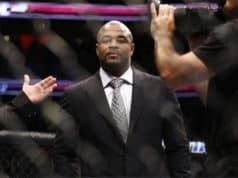 In this article, we’ll look at 10 of the most shockingly late stoppages in the history of the MMA, in which fighters have had their health, safety and on occasions even their very lives endangered due to referee negligence, incompetence and, lack of judgment. Joe Warren had to endure a shocking amount of punishment at the hands of Pat Curran during their featherweight title encounter at Bellator 60 in 2012. The champion Warren was badly hurt by a big knee to the head early in the third round of the fight and reeled backward half-way across the cage on unsteady legs before Curran unleashed several hard, clean punches that snapped his head back against the cage. Except it wasn’t. Instead, referee Jeff Mallot stood by and watched as the dazed Warren somehow managed to stand, only to be rocked again by another punch that left only the chain-link fence keeping him upright. 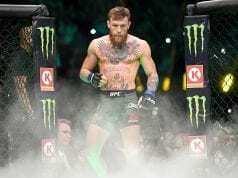 The onslaught continued despite Warren turning his back on his opponent, then again falling back against the cage as his legs almost gave out under him, before a flying knee was followed by several brutal uppercuts that delivered the KO finish. In total almost 20 seconds passed between Smith stating the fight was going to be stopped and it actually ending, while from the moment he was first stunned by the knee, Warren endured the better part of 40 unanswered blows. 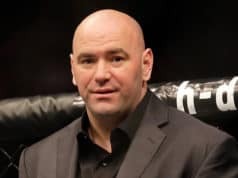 Fellow fighter Sean McCorkle admitted to being, “genuinely afraid” for the former champion’s health after witnessing him having to be practically carried back to his dressing room, where he reportedly began vomiting, though thankfully he was later given the all-clear at a hospital.